Zool is a software product built by myself, it allows users to create a digital magazine web page, the magazine is made up of different sections varying from columned sections to parallax or even fill screen videos! The reason for this build was to replace the overhead cost from an off the shelf piece of software that done the same thing. Why is it better? Its robust reliable and easily deployed, within minutes the software can be on your domain and allow you to start building your digital magazine. 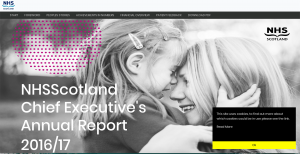 Currently Zool runs the NHS Scotland Annual Report . This will be the second year running that the system has been the backend for this website. Yes it does, Zool is a dutch word for sole, meaning singular. Originally without a name for over a year this was an idea due to having Dutch colleagues over in Eindhoven. Zool is built using Laravel, HTML, SCSS and Blade templating engine. I recently rebuilt the system over the summer to improve its codebase and future proof the software. I also carried out a massive design overhaul going from absolute basics of Bootstrap 3 and no custom styling due to time contraints on the initial build to a modern, sleek and clean UI that allows the user simplistic management and intuitive use of the system. With built in reporting functions to see approximate user locations, download tracking for files uploaded and also user login tracking, with a field for an analytics code in the settings section to allow demographics, acquisition stats and the more in-depth reporting. This allows the users of the site to get a rough estimate of how well its doing without even having to specifically go and use analytics if they don't want to.